Book in One Word: MOOORE. I never really paid much attention to Midnight Thief. But then I received a copy of its prequel novella Poison Dance (thank you, Livia Blackburne! ), and MY GOSH: I REALLY REALLY want to read Midnight Thief. 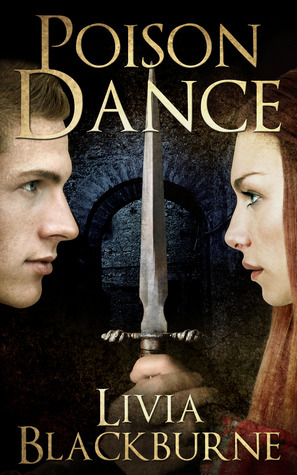 Poison Dance is, my friends, a successful novella. Reminiscent of Throne of Glass and Scarlet, this novella tells a nice story in a short amount of pages. Actually, I would've liked it to be LONGER. I understand that some scenes had to be quick and all that because it's a novella--and by the way, this isn't truly a complaint or anything--but my gosh, I wanted MORE. (Fortunately, there are some deleted scenes--110% spoilery if you haven't read the novella.) Poison Dance had good writing, an interesting plot, and attaches you to characters in a mere fifty-something pages. (I know the description says 84, but that includes other content.) And all of that makes for a pretty solid novella that leaves you wanting something in novel-length--thank gosh that's not too far away. I haven't read many novellas, but the few I have didn't typically leave me really wanting to read the story they stemmed from. Novellas sometimes seem pointless, and while the story in Poison Dance may not be necessary to know for Midnight Thief, it's still an excellent setup and a novella that's well done and doesn't seem to exist just to exist. This is a novella worth reading. And if Midnight Thief is anything like its NOVELLA, then it just might be quite GOOD. Also, the e-version of Poison Dance is currently free on Amazon, Barnes & Noble, and iBooks, so get on it. Did I love it? It's hard to say so with something so short, but maybe a bit? Would I reread it? Yep! Would I purchase it? Yes! I wouldn't even mind owning the paperback version. It'd look nice on my shelves. Who would I recommend it to? If you like Sarah J. Maas's Throne of Glass series or A.C. Gaughen's Scarlet novels, then check this out. Also, if you're a fan of assassinry. Really, I don't think I'd tell anyone not to read this. I received a copy of this book from the author in exchange for an honest review, and that in no way sways my opinion of the book.